Warming temperatures, rainy days, sunny skies – these are just some of the signs that spring is here. While your lawn probably maintains its dingy brown winter look, soon, it will be blossoming with the rest of the flowers, shrubs and trees – but only if you provide the right care for it now. Set aside a few hours to maintain your lawn and you’ll be assured to have a bright green, thriving lawn that lasts through fall. When the ground is dry, head out to the yard for a family clean-up session. Remove old leaves and fallen twigs. Then rake the grass to fluff it up a bit. Be sure to leave the shoots of grass behind, so don’t rake too vigorously. If you’re still waiting for snow to melt, spread mounds of snow out over the lawn to avoid a pile that will smother and kill the grass. The best way to control weeds is to nip them in the bud. Before they ever make an appearance, apply a pre-emergent weed-control product. This way, before weeds can grow and smother the grass, you’ll give your lawn a fighting chance to survive. If you’d prefer not to use an herbicide, the next best step to take involves proper lawn care. Growing a thick, healthy grass will naturally choke out weeds. 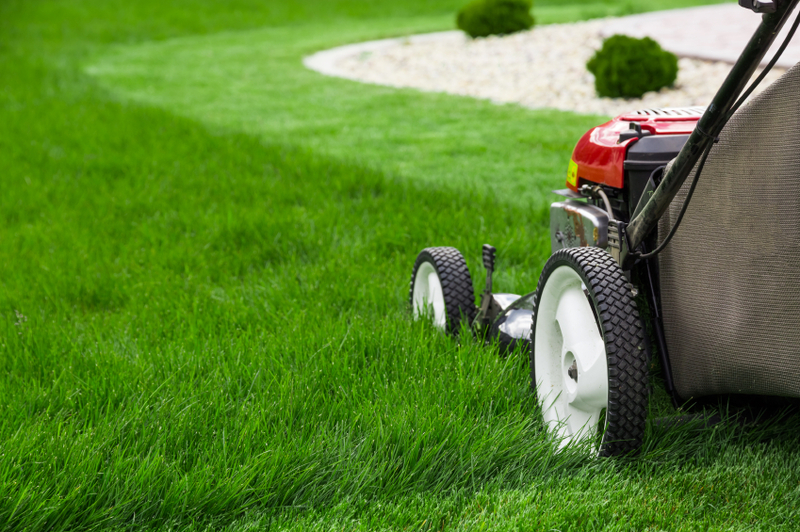 Mow regularly, reseed grass when necessary, lay down sod in bare patches, and give preference to natural herbicides to grow a healthy lawn and preempt weeds from growing. If your lawn has bare spots or you want to plant a new section of grass, now’s the time to do it. If you choose to lay down sod or plant seeds, forego the pre-emergent weed control step. If you apply an herbicide, it’ll kill new grass, too. Laying down sod is the quickest way to a robust lawn. While it costs more upfront than planting seeds, you’ll get an instant lawn that’s thick and weed-free. With planting seeds, you’ll have to do a lot of maintenance to nurture its growth, such as being careful that people and pets don’t walk on the grass, performing weed-control measures and diligently watering it. A healthy lawn is a fertilized lawn. The best time to apply fertilizer depends on where you live. Warm-season grasses should be fertilized in late spring, once the lawn turns green. Apply fertilizer to cold-season grasses with a light hand in the spring only if your lawn is in really bad condition. Too much fertilizer will cause too much early growth grasses, which won’t be hardy enough to last through the summer’s heat. Then, fertilize again in the fall, which is when the growing season for cool grasses is at its peak. Attend to your lawn now and you’ll enjoy beautiful grass all spring long – and well into fall. Cleaning up the lawn, targeting weeds, planting seeds or laying down sod and fertilizing will give grass a fighting chance to survive and thrive.